Almondbury Old Ale is a rich tawney, heavily hopped ale. 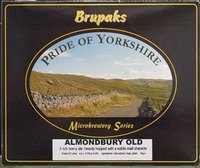 Almondbury Old Ale is a two can kit from the Brupaks Pride of Yorkshire Microbrewery Series which produces 40 pints of rich tawney coloured ale, heavily hopped with a subtle malt aftertaste. The hop flavour can be enhanced by using the bag of hop pellets supplied with the kit.